The AstroNuts on the pool deck just before testing their anchoring device, the DAME. From left: Jahnavi Murali, Tom Krajnak, Kelly DeRees and Marysa Addis. A team of Ohio State engineering students has designed a tool for astronauts that could be used on future spacewalks. The AstroNuts recently became the first Ohio State team to participate in NASA’s annual Micro-g NExT (Neutral Buoyancy Experiment Design Teams) program, in which undergraduate students from across the nation are challenged to propose, design, build and test a tool or device that addresses an authentic, current space exploration challenge. The team from Ohio State submitted a design for a tool that would anchor an astronaut to the surface of an asteroid. Called the Device for Anchoring in a Microgravity Environment (DAME), the tool uses one 10-inch long auger driven by a ratchet to drill into the asteroid surface. 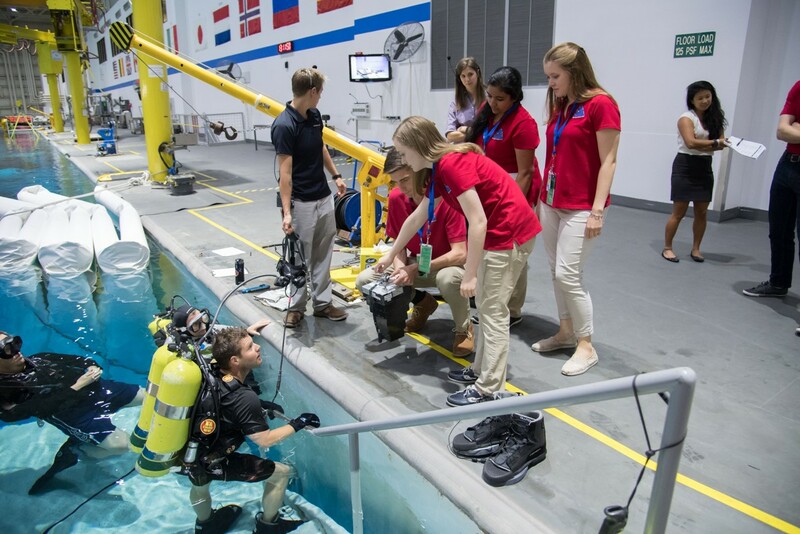 Their proposal was one of only about 30 chosen for testing at the Neutral Buoyancy Laboratory (NBL) at NASA’s Johnson Space Center in Houston, Texas in May 2017. The team briefs the NASA divers who will be conducting the test, showing them how to operate DAME.After two semesters of building, extensive testing and refining their concept, the team was excited to see their design in action in the NBL’s 6.2 million gallon indoor pool, which simulates an asteroid’s surface. “The trip to Houston was the culmination of nine months of hard work and long, stressful nights. Handing the tool to the NASA divers and watching it get submerged in the NBL was a great moment,” said Kelly DeRees, a third year in materials science and engineering. Fellow team members include Marysa Addis, third year in electrical engineering, Jahnavi Murali, third year in chemical engineering and Tom Krajnak, BS’17, aerospace engineering. There were many constraints and conditions the team had to consider, DeRees said. The tool had to be just the right size and shape to allow an astronaut with large gloves and limited mobility to use it. It had to function underwater in a chlorinated pool, surrounded by loose floating sand that could potentially jam moving parts. NASA also had safety requirements and restrictions on size and materials that affected the design. The AstroNuts spent nine months perfecting the device, even gaining insight from engineers who worked on the Hubble Space Telescope servicing missions. “By the time we reached Houston, we had learned so much and it was a great feeling sitting in the test control room and watching our tool succeed,” said DeRees. The DAME met all challenge objectives and received highly positive feedback from the divers, particularly regarding the ergonomics of the device, which the team had prioritized during the design process. All Micro-g NExT tested designs are archived in a NASA database that is accessed by engineers designing spacewalk tools for future missions, which means the DAME could influence the design of a new space tool. Along with gaining experience in mechanical design, experimental testing and proposal writing, the students got to take part in outreach as well, an important component of the Micro-g program. The AstroNuts conducted several outreach activities at The Bridge, a local community center in Columbus dedicated to serving the needs of children of Somali immigrants. Each session focused on a different theme that emphasized the importance of STEM skills and NASA’s work. While outreach efforts will continue, prior commitments will prevent the same students from entering the upcoming Micro-g challenge, although DeRees said they’re interested in serving as Test Week Assistants at the NBL and as mentors to the next Ohio State team. The AstroNut’s NASA mentors were Brian Roberts and Matt Morrow, both of Goddard Space Flight Center. Associate Professor Mark Ruegsegger of Ohio State’s Department of Biomedical Engineering served as the group’s faculty advisor.